I’m just over two months into this “freezer cooking” commitment for 2019 and I have to say that so far- THIS. IS. AWESOME! I absolutely LOVE opening the freezer to find beans and rice, already prepared for dinner. I LOVE sitting down to make a meal plan and writing down a meal that I put in the freezer a few weeks ago. And I really, REALLY love when it’s time to make dinner and all I have to do is dump something into the Instant Pot and hit go! Having a stash of dump dinner recipes in my freezer is totally rocking my world, but it wouldn’t happen if I didn’t have a plan to get those meals in the freezer in the first place! The last time I did a freezer cooking session I focused on breakfast. I dedicated just one hour to making NINE breakfasts and cooked everything LIVE on Facebook… it was terrifying, and so much fun! (You can watch the entire video HERE, and you can download the exact cooking plan I followed and recipes HERE. I want to do another one hour cooking session, but I want to focus on dump dinner recipes. 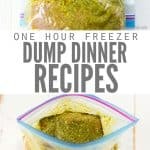 What are dump dinner recipes? A dump dinner recipe is a meal that when you open the freezer container, you “dump” it into a skillet (like this one) or slow cooker (I use this here) or Instant Pot (my favorite here) and you’re pretty much done. Some say that dump dinner recipes shouldn’t include anything else other than what’s in the freezer container, but I feel like that pigeon-holes you into certain types of recipes that you or your family may or may not like. Maybe your husband isn’t a fan of roasts. Or maybe you like your side vegetables to be crispy instead of soft. If either of these were the case, your choices of dump dinner recipes would be greatly limited! That’s why I like to broaden “dump dinner recipes” to include meals that may need a simple side dish, like rice or baked potatoes or tortillas. Even if my dump dinners need aren’t 100% ready to go on their own, I can usually prepare side dishes ahead time by cooking in bulk. My husband knows that anytime I make rice or beans or lentils or quinoa in the slow cooker, I make A LOT. It’s very normal for me to double or triple a recipe so that I can freeze several portions for future dinners. That’s how I can still press the ‘easy button’ when I make a dump dinner recipe that needs a side dish –when I pull out my main meal to thaw, I pull out those ready-to-go side dishes too! As I mentioned, the idea of having a dump dinner recipe in the freezer isn’t good enough. You need a PLAN in order to prepare that recipe now, so it’s ready when you need it later. 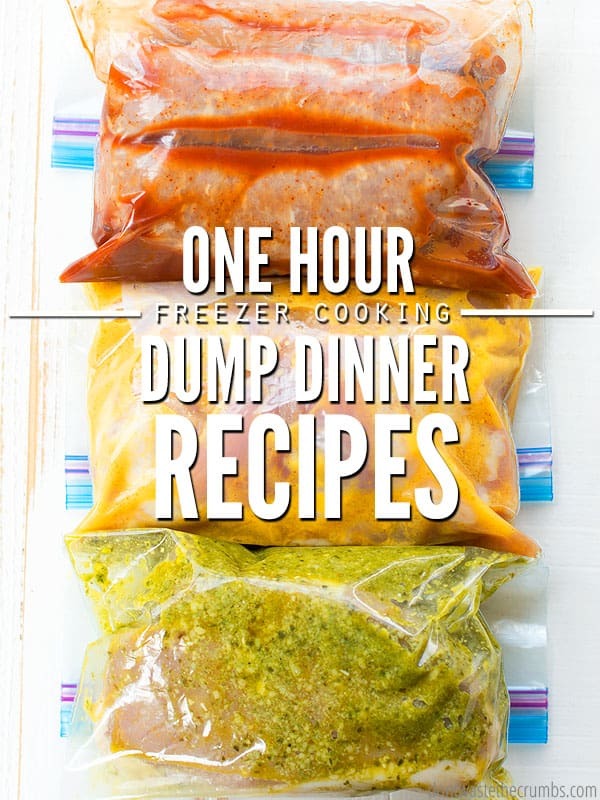 And that’s exactly what I’m sharing with you today: my one hour freezer cooking plan for dump dinner recipes! I’m pretty strict when it comes to which recipes I put in the freezer and which ones I don’t. Every recipe has to be easy. No ninja cooking skills required! Every recipe needs to be affordable. They don’t have to be rice and beans cheap, but we can’t go all out lobster and prime rib here. Every recipe needs to use normal ingredients. 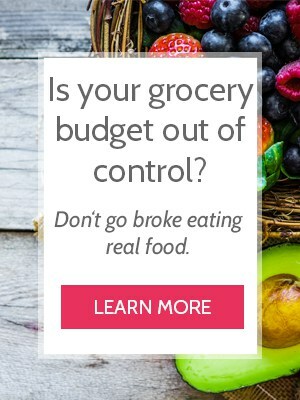 If I can’t find something at my local grocery store, it’s not happening! Just like the breakfast meal prep session, I’m cooking this LIVE on Facebook! This Friday, March 22, 2019 I am going to me following this EXACT one hour freezer cooking plan and making everything LIVE on Facebook. 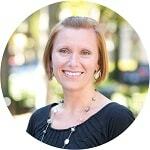 I’d love for you to join me! I’m going live at 10am and you can click HERE to watch. If you’re a few minutes early (which I recommend), refresh your screen now and then and my video will pop up when I’m live. Remember that this is a ONE HOUR cooking session, so I’ll be live for awhile… feel free to watch and cook alongside me, or watch/listen while you’re folding laundry, doing the dishes or working on some other chore. Close any pop-ups that you get. From the menu bar (left on desktop, top on mobile), click on the VIDEOS button. Look for the video dated March 22, 2019 with “freezer cooking” in the title. Update: Here’s the link to the recorded video! Enjoy! Make sure you have EVERYTHING you need BEFORE you start. Obviously this includes ingredients, but this also includes any appliances or tools or storage supplies you might need. I recommend grocery shopping the day before you cook. That means if you cook on a Saturday, shop on Friday. Your actual cooking time won’t take any longer than an hour, but tack that onto a morning of hectic grocery shopping and crowded stores and it quickly becomes a long day. Plus when you shop the day before, you can simply leave out anything you need for the cooking session instead of putting it all away! Clean the kitchen before you start. Clear off the counters and put away unnecessary appliances so you can start with a clean slate. Empty the dishwasher and wash the dishes. I went through WAAAY more spatulas during my breakfast meal prep session than I thought I would, so it’s important to be over-prepared. Besides, you’re going to make a lot of dirty dishes. Those dishes need somewhere to go! It includes a supply list, a grocery list, all of the recipes we’re making and the EXACT steps to follow to pull off making five awesome dinners for your family! Note that clicking the link will trigger a pop-up form. Enter your information to have the recipe sent to you via email. Please allow up to 12 hours for the email to be delivered and check spam folder and “promotions” folder if using gmail. If you still can’t find the download, please email me tiffany (at) dontwastethecrumbs (dot) com. We’re going to be making each recipe twice for a total of TEN dinners. Be sure to print the recipes before you begin! The FREE 2lbs of ground beef for life is available now through March 31, 2019, but it’s only while supplies last. They ran out the last time this promotion was available. I highly suggest you take advantage of this deal ASAP if you’re interested in getting two pounds of FREE GRASS-FED GROUND BEEF every single month! Click HERE for ground beef for life. Each freezer cooking session is slightly different from the next. When we made nine breakfasts in one hour, having multiple mixer attachments, mixer bowls and blender jars was super handy. This time around, I’m using these baggie holders to make my life easier. They hold sandwich, quart and gallon size bags open for you so you can fill the bags without worrying about making a mess everywhere. Anyone who has ever tried to ladle leftover spaghetti sauce into a freezer bag knows exactly what I’m talking about here! I also recommend having two cutting boards ready before you begin. We’ll be cutting both meat and vegetables, so having two available will prevent contamination and help us to keep a good cutting pace too. 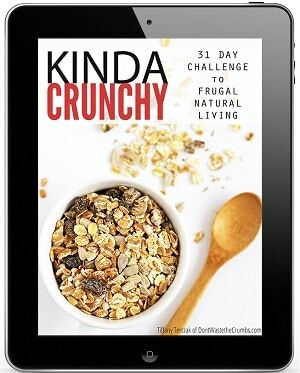 Read through every recipe, all the way through. Reading through the recipes will help you to know exactly what type of storage containers you need, and how many, in order to make the recipes work. It also lets you know what measuring cups you might need, how many, and any other tools you might need. 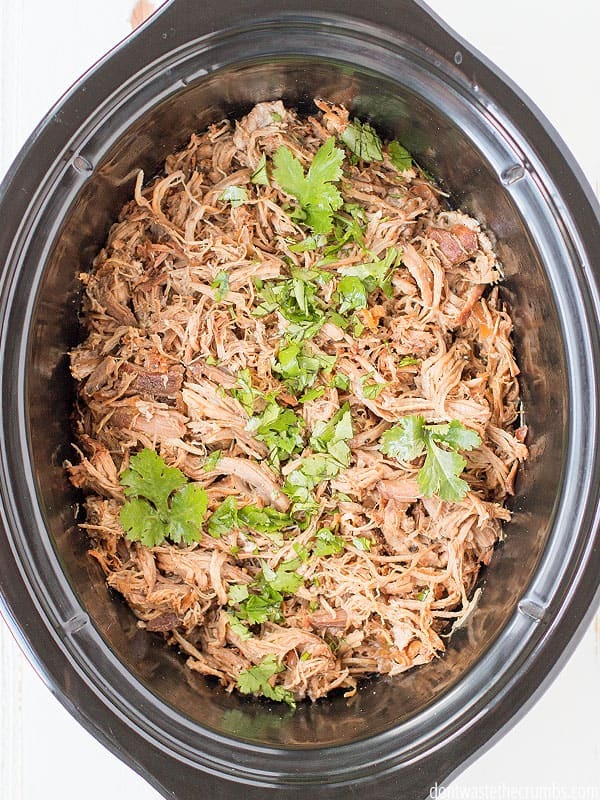 ***NOTE: A few of these recipes are for the crockpot or slow cooker, but if you’d like to convert them into an easy INSTANT POT recipe, you can read about that here. This doesn’t sound important, but TRUST ME! This will be a very fast hour and once everything is in a bag and frozen, IT ALL LOOKS THE SAME!! Use a permanent marker to label what will go in the bag or container, the cooking instructions and today’s date. Let’s get these dinner dump recipes started! 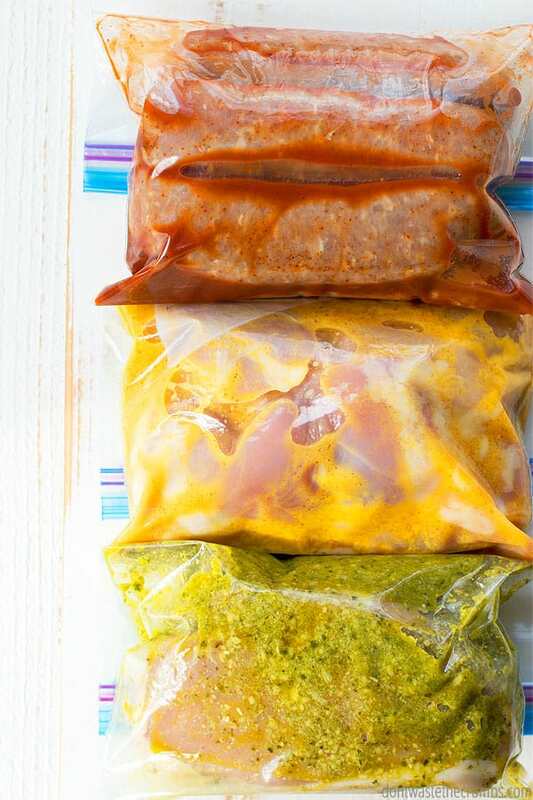 Chop the vegetables for The Very Best Slow Cooker Carnitas and place them in the storage bags. 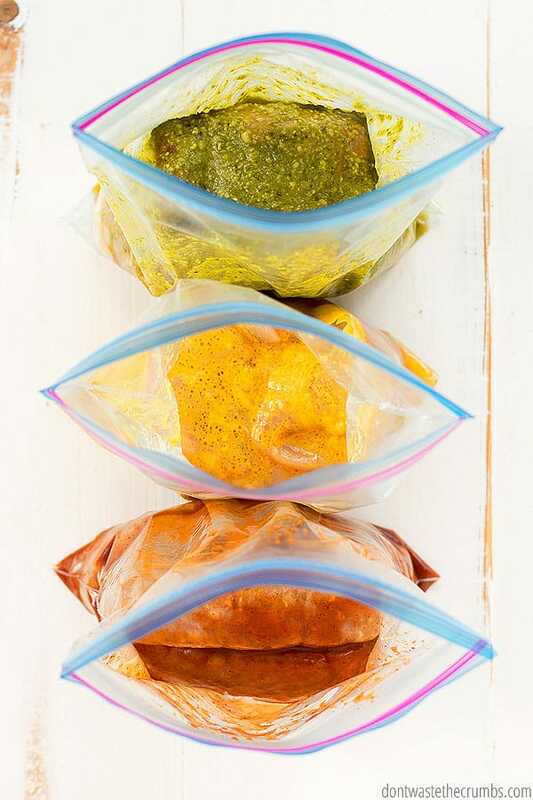 Measure all the seasonings into the bag and then add ½ cup of liquid. Squeeze the bags so that the spices and onions and liquid mix together. Place the pork roasts into the bags. Remove as much air as possible and set aside for the freezer. Chop the vegetables for Slow Cooker Beef Ragu and place them in the storage bags. Measure all the seasonings into the bag and then add the crushed tomatoes. Place the chuck roasts into the bags. Remove as much air as possible and set aside for the freezer. Chop the vegetables for Sheet Pan Sausage, Peppers & Onions and place them in the storage bags. Measure all the seasonings in and then place the sausage links into the bags. Remove as much air as possible and set aside for the freezer. 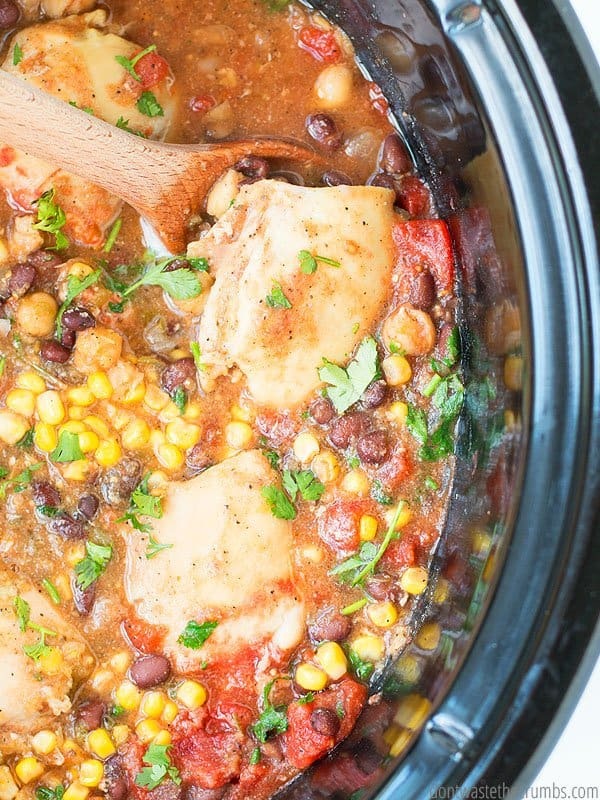 Measure corn and then beans from Slow Cooker Salsa Chicken into the storage bags. Add the two salsas and squeeze the bags GENTLY so that everything mixes together. Place the chicken into the bags. 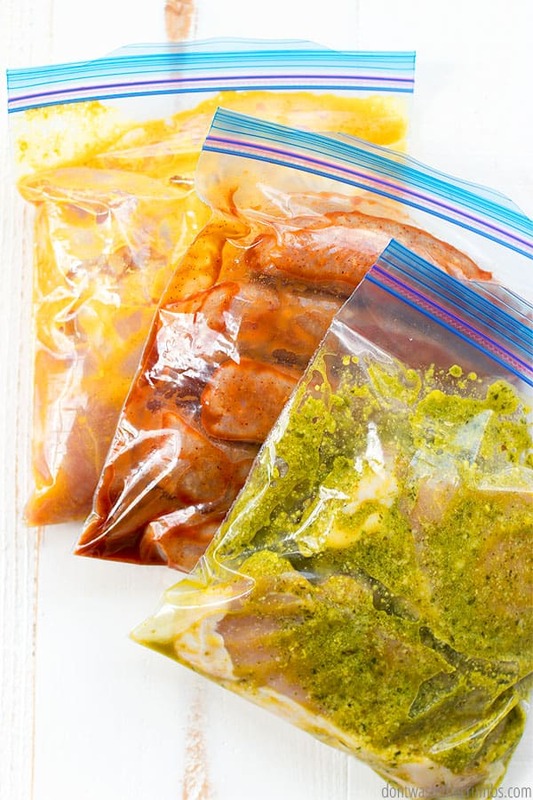 Remove as much air as possible and set aside for the freezer. Shred 3 cups of cheese and divide between two sandwich baggies. 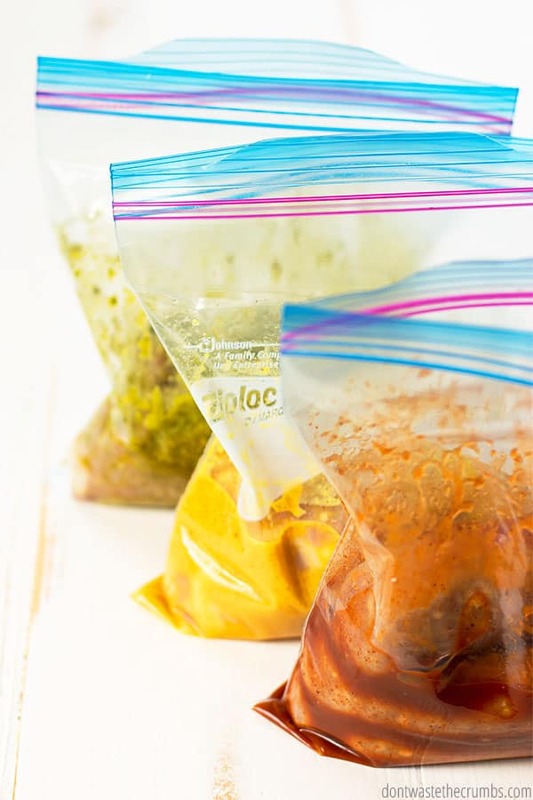 Measure the vegetables from Homemade Cheeseburger Helper into the storage bags. Add all the seasonings and then add the tomato sauce. Place the ground beef into the bags. Remove as much air as possible and set aside for the freezer. Double check that your bags are labeled and give yourself a pat on the back – you’re done! I highly recommend laying the bags flat to freeze at first. Once they’re frozen through, you can stack them like books in the freezer. I’ve found that this is the best way to utilize freezer space! 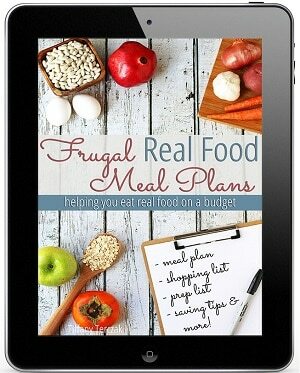 Dump Dinners are perfect for busy families to have easy, healthy, real food meals ready for the week. If this has whet your appetite for freezer meals, I guarantee you’ll LOVE the Freezer Family HERE! 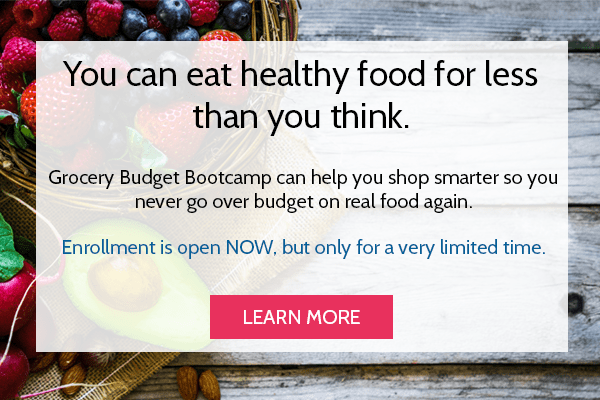 You can get full meal plans with meals, grocery lists, and more (basically all the dirty work done for you). Are you doing these dump dinner recipes with me? I’d love to hear how they’re coming along for you! Is there a specific type of cooking session you’d like to see here on the blog? Let me know your thoughts in the comments section below! I do this as I make my regular dinners, after leftovers 1-2 times we freeze the rest and I feel like I have “money in the bank”! Last fall I made a turkey and made l lot of enchiladas and used corn tortillas, I don’t recommend that as it all turns to mush. I am not a big fan of tamales because they are mushy but if you like them then the corn tortillas probably won’t bother you. I’ve found the same when I freeze corn tortillas, but flour works nicely! Another option is to not assemble the casserole before freezing, but freezing the filling. Then you can make an enchilada casserole later by just layering the filling with the tortillas. Plus it’s faster since you don’t have to roll them up! Tried the beef ragu and salsa chicken – the whole family loved both of them! Thanks for sharing the great recipes! 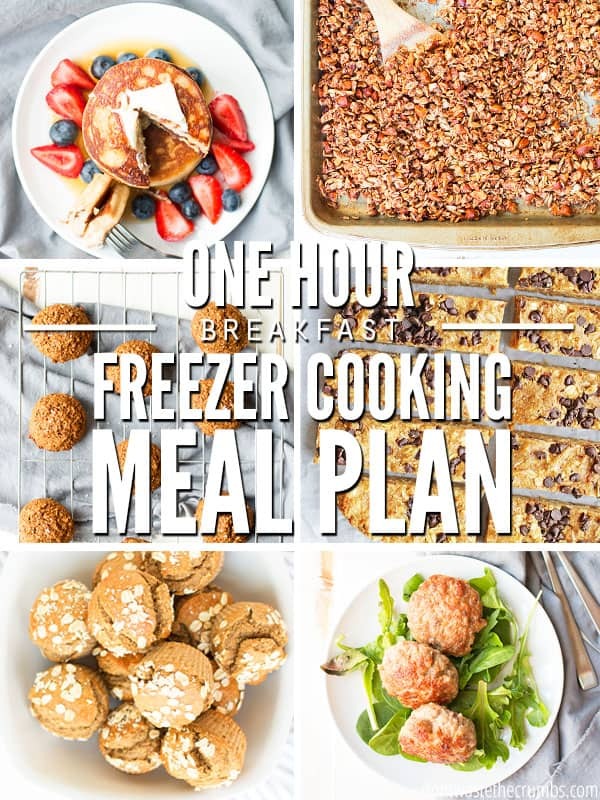 Enter your information below to have the Freezer Cooking Plan: Breakfast (including recipes, shopping list and step-by-step instructions) delivered straight to your inbox! 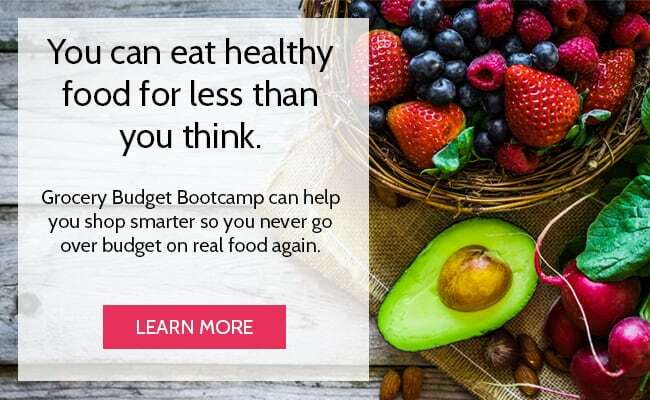 Enter your information below to have the Freezer Cooking Plan: Dump Dinner Recipes (including recipes, shopping list and step-by-step instructions) delivered straight to your inbox!